Hay Making with Hay Caps. Today I thought I would share something a little different with you…. something that might give you a bit more of an insight into us as farmers. 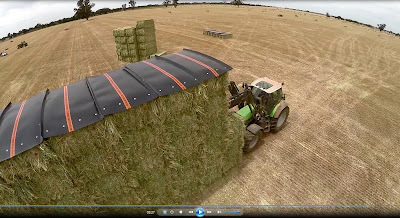 Eight years ago we invented the Hay Caps, a covering system for large square bales of hay. At the time we were looking for a better way to cover our stacks of hay. We couldn’t find it, so invented it ourselves, and thought that if we needed it then maybe other farmers would need it too. A few weeks ago we had Vince Bucello from Midstate Video Productions here filming for a documentary on Australian agriculture. He spent a day with us filming the making of oaten hay. Whilst Vince was here we got him to make us a Hay Cap promo incorporating some of his amazing drone and GoPro images. Hay Caps are a big part of our operation now - their usage is an integral part of our hay production and storage; and the manufacturing, marketing, sales and dispatch of Hay Caps take up a lot of our time. The whole process from inventing a new concept to the actual manufacture and distribution of that product has been an amazing experience. And to see it flourish, employing local people, as well as changing the way that hay is covered around the world is humbling. Over the course of nearly 2 years of my daily photographing our farm and sharing on this blog I have been very careful not to make it about Hay Caps. We are farmers. We are passionate about making top quality fodder. That’s who we are. That’s what we do. Hay Caps came about because we are farmers, who needed a better way, a safer way, a more durable way to cover hay. This blog is about us as farmers. But occasionally something comes along that I just can’t not share, something I hope will give you an insight in to us as farmers. Very interesting! Enjoyed watching the promo; thanks for sharing. And that is exactly why it does work - the hay doesn't breathe in the plastic. Hay can be baled at higher moisture & low dry matter content and then wrapped in plastic to omit oxygen. This allows the hay to ferment inside to become what is known as silage. It can be stored this way for many months. We can bale hay successfully in summer because of our hot dry temperatures. Many places can't get the grass/alfalfa dry enough to make hay. 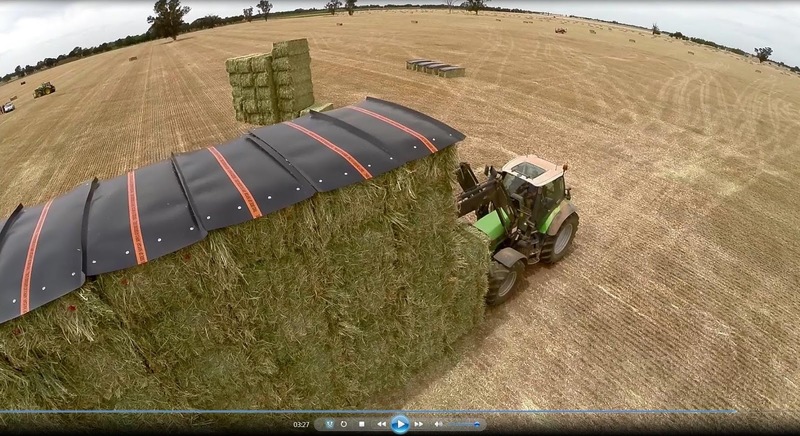 So their option is to bale at a higher moisture content and wrap up. Great vide showing how the hay caps are attached! I have never seen them before. Are they sold in Canada? Yes they are. We have a company making them in America for us under licence to sell throughout the US and Canada. That was so cool to watch. The farmers around here have rolled bales which they wrap in white plastic. Farmers are pretty creative when it comes to useful ideas. FArmers just need more time to think about things. Brilliant. A classic illustration of necessity being the mother of invention. I hope it brings you a healthy additonal income too. Very impressive! And damn, those are some kinda huge bales! Locally we only see smaller bales and plastic wrapped big rolls. Totally impressed, by the size of the field and bales, machinery, and your invention. I love Rose's comment. Thanks farmers, a lot of straw. Wow! Thanks for sharing! Don't keep wonderful innovations like this a secret Lynda! Quite fascinating to watch. Even the stacking machine, which I had not seen before. The video was well made too.